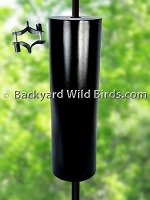 This Raccoon Proof Bird Feeder Pole System is a top raccoon proof pole with bird feeders. Unique Pole makes bird feeders hung above its long baffle raccoon and squirrel proof. 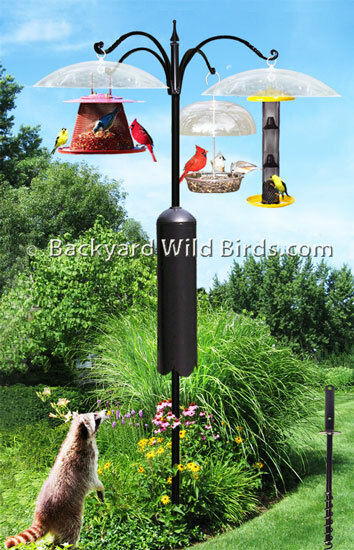 Pole comes with four bird feeder hanger arms, 3 bird feeders, a long 28" black cylinder raccoon baffle and a twister ground socket. Complete with two 20 inch clear baffle domes, Cardinal Red Sunflower Seed feeder, Goldfinch Yellow Thistle feeder and multi purpose Tray bird feeder. Birds love to cling to the wire mesh feeders which can accommodate a large number at the same time. The versatile tray with an adjustable height dome can hold seed, meal worms, fruit, nuts, etc. This combination of feeders can attract and feed a great variety of wild birds and bring them around for you to see. The tubular steel pole has a 1 in. diameter and comes in three pieces. The four hanger arms are wrought iron and have a 12" reach on each arm. It is approx. 90 inches above ground. The 28 inch long raccoon baffle comes with a mounting clamp that can be adjusted for its proper height setting. The 20 inch ground socket has 1/2" turning holes to twist in place. Its finish is black semi gloss, rust resistant, powder coat. Mount the pole 10 ft away from objects and watch this pole do its job. Excellent system that you and your birds will love!